IKARIA ISLAND or ICARIA, GREECE situated southwest of Samos island, derives its name from Icarus, the son of Daedalus who according to the Greek Mythology fell into the sea near by after he got too high and too close to the sun and the wax that was holding the feathers and his wings together melted from the heat. The North Eastern Aegean island of Ikaria with its green mountainous countryside as well as its wonderful beaches, has surprisingly kept away from mass tourism. This has led to the Ikarians having kept much of their true characteristics and customs. It is an island that is very much loved by its own people, who return for their vacation to Ikaria year after year. 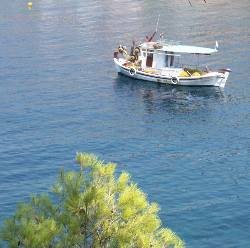 You can reach Ikaria either by boat from Piraeus port of Athens and ferry boats from other major Greek ports. 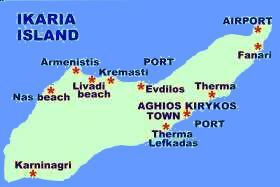 There are also flights fro Athens international airport direct to the island of Ikaria.